Riley McCusker is the new rising star of the talented U.S. senior women’s gymnastics team. She lives in Brielle, New Jersey and trains at MG Elite with Maggie Haney, coach of 2016 Olympic champion Laurie Hernandez. Once her elite career is over, McCusker plans to join the Florida Gators’ NCAA gymnastics team. McCusker had an impressive breakthrough year in 2016, her last year as a junior and her first year as an elite gymnast. She won a silver medal in the all around at the P&G Championships, as well as silver also on the uneven bars, balance beam and floor exercise. McCusker turned senior in 2017 and was selected to represent the U.S. at the AT&T American Cup in March, along with teammate Ragan Smith. The American Cup was McCusker’s first ever international assignment, and she struggled to keep her nerves at bay, falling both on bars and scarily on beam, for a still impressive fifth-place finish. 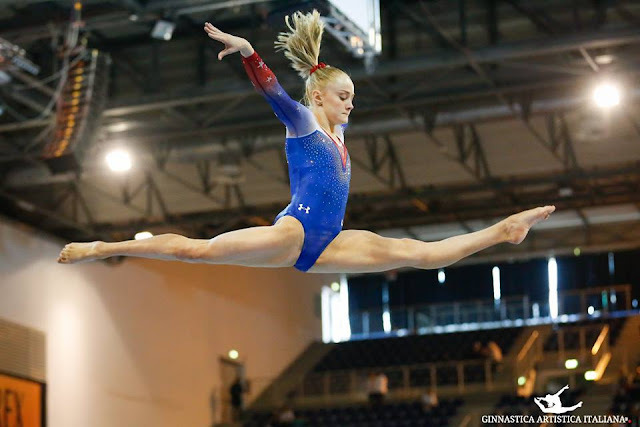 The American Cup finish hurt her pride, but her disappointment boost her determination, and McCusker came back strong at the 2017 Jesolo Trophy, where she won gold medals with the team, in the all around and on balance beam, as well as silver on the uneven bars. 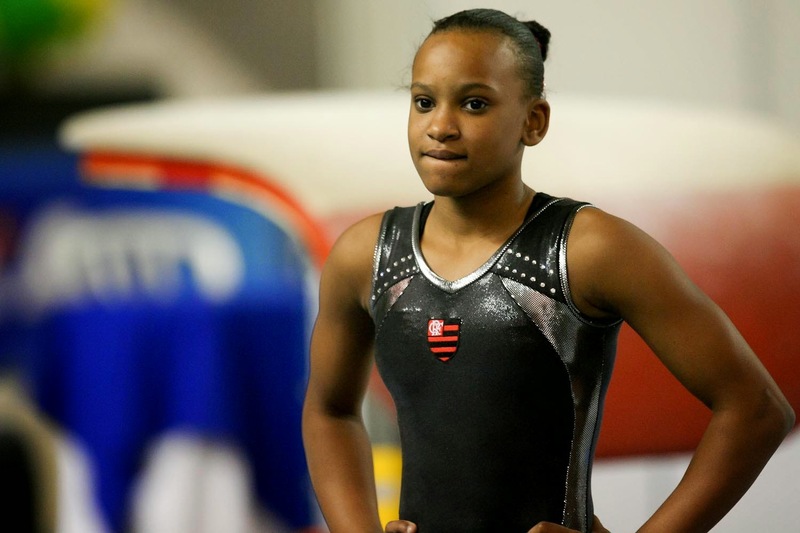 She is one of the top contenders for the U.S. National all around title next August. McCusker performs a strong double-twisting Yurchenko. Her vault could be a bit tighter, a bit higher and with a bit more amplitude, but it is still one of the top DTYs in the U.S., and her landings are precise. The DTY is worth a 5.4 D-score in the current Code of Points. The uneven bars is McCusker’s best apparatus. She performs a Stalder full pirouette + Maloney + Tkatchev (D + D + D, CV 0.3), a Stalder piked Tkatchev (Downie) (F), a Stalder Tkatchev (Ricna) + Pak salto (E + D, CV O.2), a Maloney with half turn (Van Leeuwen) (E), and a unique half-twist double tuck dismount (E). She has beautiful lines and execution throughout, and an uncanny ability to find her handstands. Her final D-score is a huge 6.2. On balance beam McCusker has a lot of difficult elements, presented with grace and poise. She performs a triple turn in tuckstand (E), a double turn in tuckstand (D), an aerial walkover + split jump + straddle jump (D + B + B, CV 0.2), BHS step-out + LOSO + LOSO (B + C +C, CV O.2), switch split leap + switch split leap half + back tuck (C + D + C, CV 0.3), aerial cartwheel (D), switch ring leap (E), BHS step-out + BHS + double tuck dismount (B + B + D, CV O.1). Her total D-score is an impressive 6.1. On floor, she performs a beautiful routine, where she impersonates what she calls a ‘sassy ballerina’. McCusker is indeed very graceful on this apparatus, but she also performs some big tumbling passes, including a full-twisting double tuck. Her routine is formed of: a full-twisting double tuck (E), a Memmel turn (D), a double-twisting layout into front tuck (D + A, CV O.1), a double turn in tuckstand (D), a double pike (D), a switch ring leap + switch split leap 1/1 (C + D), and a double tuck (D). Her final score is a 5.3. Riley McCusker could become one of the top U.S. gymnasts of this quad. She is powerful and precise, as well as elegant, poised and with an international look. Her beautiful lines, long and stretched arms and legs, pointed toes and elegant hand positions make her stand out especially on bars and beam. On bars in particular, her difficulty, precision, handstands, amplitude and overall beautiful execution make her a world-class athlete and a World championship-medal contender. On floor, she still needs to work on consistency and landings, but her presentation, choreography and interpretation of the music are stunning for such a young gymnast. Her lines and posture are reminiscent of Nastia Liukin’s. Nastia, like Riley, turned senior the year after the Olympics, and her journey to the 2008 Olympics was long and perilous – but it paid off. Can Riley repeat Nastia’s success? Watch out! Elena Eremina is a Russian gymnast who will turn senior in 2017. She is best know for winning the all around gold medal at 2016 Junior European championships. She does a double twisting Yurchenko but struggles with it. She either falls or under-rotates it. She doesn't really have a good height which explains her struggle. She needs to work on that. She does a big release, Ricna (E) but doesn't have good height on it. But has a good one on her straddled Jaeger. She has a decent technique on her giant swings and has competed a Maloney 1/2 bars transition. She dismounts the apparatus with a full twisting double back. She confidently competes on beam, no hesitation. She does BHS to two LOSOs series and a triple twist dismount. However, she struggles on her turns. She has an amazing difficulty for a junior. She does F rated double layout, E rated full in tuck, E rated triple full, 1.5 twist indirectly connected to 2.5 twist and a memmel turn. Bottom of line: She doesn't wow me like when Komova was at her age. She doesn't have the Russian elegance like her compatriots Aliya Mustafina, Ksenia Afanasyeva and Anna Pavlova. But she is definitely someone I'd expect to be one of the top Russian gymnasts at the upcoming quad especially that she shows confidence on beam which the Russian team has lacked over the past few years. However, she needs to work on polishing up her skills and choreography and to work on her form and landing. Laura Jurca was born on September 12th, 1999 in Munich, Germany. She is best known for winning the silver all around medal at the second edition of Youth Olympic games. On vault, she has a glued leg and nicely executed double twisting Yurchenko. It would be better, if she had a higher height and pointed her toes. She needs to work on her landing as she seems to have a habit of taking a huge step on it. Her style is stiff on bars but her legs are glued together. She has a low height on her bars releases, a Hindroff (E) and Geinger (D) bars releases as well as on her full in dismount. She lacks fluidity. However, she is okay on bars for an all arounder. Considering that Romania is weak on bars, I expect her to compete on the event in team finals. She is confident on beam and does not seem to hesitate before performing her skills. On the other hand, her difficulty is so far behind. She also doesn't hit her leaps. She has presence and nice choreo, and mediocre difficulty. Bottom of line: She is adorable. Assuming that she will be working on upgrades, I believe she will be Romania's second AAer knocking Diana Bulimar out. Not to mention her service will be needed on bars in team final. The downside about her gymnastics is low height on the four events, not hitting her beam leaps and her mediocre difficulty. Hopefully, she will upgrade and work on improving. She will be considered a lock for the Rio Romanian team. 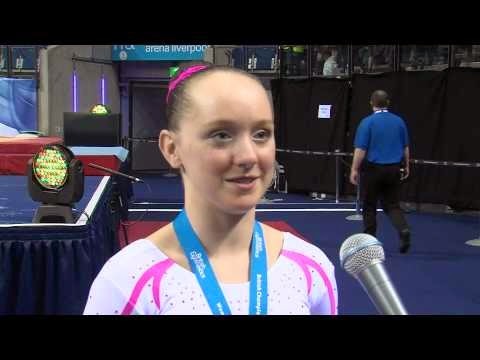 Amy Tinkler was born on October 27, 1999 in County Durham, England, UK. Her strongest event is floor exercise. She was crowned as the English champion last month. Tinkler competed at last year's Junior European championships where she won silver on floor exercise and with her team, and a bronze on vault. She was also a part of the silver medal winning team at 2013 European Youth Olympic Festival. On vault, she does a double twisting Yurchenko, nice height and form. I won't be surprised if she trained an Amanar. On bars, she swings smoothly and does her dismount beautifully, but suffers from excessive form break and leg separation. She does a maloney (D) as transition, Tkatchev (D) as release and a full twisting double back tuck (D) as dismount. On beam, she is easy on the eyes. She does a gainer layout step out (C) to a layout step out (C), worth 0.1 connection bonus, a side aerial (D) to wolf jump (A), worth 0.1 connection bonus, double turn with leg below horizontal (D), switch leap with half turn (D), back tuck (C), front aerial (D) to switch leap (C) to leap (A), worth 0.1 connection bonus. She ends her routine a difficult triple full dismount (F). Execution wise, it will be better if she cleaned up her form on her acro elements. She is a dynamic floor worker. She opens up with an H rated full twisting double layout and does an F rated double straight layout as her second pass. Bottom of line: Her type of gymnastics is similar to her compatriot Claudia Fragapane's but with way cleaner form and execution. I can also see her as Great Britain's top AAer in this quad. On a World stage, she has potential and capability of making the top placements but first she needs to upgrade and work on her bars and beam execution. Andreea Iridon was born on November 23, 1999 in Sibiu County, Romania. Iridon competed at European Youth Olympic Festival where she won bronze medals with her team and on balance beam. She placed fourth on floor exercise. The following year, she competed at the junior European championships where she won silver medals on beam and floor, and a bronze with her team. On vault, she does a very easy vault 'a full twisting Yurchenko'. She is obviously no vaulter, she takes time to complete her simple twist. Most likely, her services on vault won't be needed in team finals. Considering how weak the Romanians are on bars, Iridion might have already secured a spot on the Olympic team. She is good on bars and not just for a Romanian gymnast. It is possible to see her at Worlds' and Europeans' bars final. She does a Ricna (E) and gienger (D) as releases. She is confident, solid and have an artistic choreography on balance beam. She does a 1.5 Y turn, side aerial, side somi, a switch leap to full Y turn and an E rated double back pike in combination. She is not shy and is very expressive on floor, she knows how to sell her routine, while her difficulty is mediocre. Bottom of line: If she stays healthy, she will make the Rio Olympic team with no doubt. She has a very loud personality and is full of confidence. Individually, she is capable of winning medals only if she upgrades. Considering her vault, I don't expect her to be an all arounder but if she proved she can do a double twisting Yurchenko, she can replace Diana Bulimar, but will never top Larisa Iordache. Regarding bars, I don't think she stands a chance on topping or successfully competing against the World's best bar workers. Rebecca Andrade is a Brazilian gymnast who as a junior made waves when a video of her performing an Amanar hit the Internet in 2013. Andrade was born on May 8, 1999, Guarulhose, the second most populous city in the Brazilian state of São Paulo. She made her international debut at Youth South American championships where she dominated the competition. She won medals in every single final, including winning the all around, vault and uneven bars gold medals. Two years later, she repeated this feat at Junior Pan American championships, as she won gold medals on vault, bars and beam, and silver medals on floor exercise, and in team and all around finals. She was set to represent her country at 2014 Youth Olympic games but had to withdraw due to a minor injury, a broken toe. She was replaced by Salvia Saraiva who impressed at the games. Andrade is one of the most promising gymnasts who are turning senior this year. Her mother had to borrow money to buy food and there was no money left for anything else, the clothes she had were donated by people who knew her. The gym she went was a public one and the breakfast that was left was donated to her family. Her coach, Keli Kitaura, knew that Rebecca had talent so she asked her mother if she (Rebecca) could live with her, so she wouldn’t miss practices anymore. They lived together for some time, but Keli had to move to Curitiba, a city far away from where they were living. When she was settled in, Rebecca moved there and after some time Keli was hired by Flamengo (where Jade, the Hypolitos and a huge part of brazilian team go) and they both moved again. Now she and other 9 girls live with Keli and her husband. She also has a contract with a telecommunications company and a salary of Flamengo, the brazilian team and bolsa atleta, a government assistance to athletes. With that money she helps her mother that doesn’t have any more depts and her 3 siblings are also doing gymnastics. She is excellent on vault and I am not even exaggerating. Her Amanar is very high and well executed that she can be mistaken as an elite American gymnast. Her bars is very decent, she has nice swings and execution. She doesn't have a difficult routine, but I believe, she has a potential to upgrade. She does a Tkatchev (D) and piked Jaeger (D) as releases, a Maloney (D) as a bar transition and a full twisting back handspring dismount (D). And she is training a G rated bars release, the Nabieva. On beam, she is fluid but not completely solid but has the potential to. She also does a layout to two feet (E). The music is catchy and she dances well to it. Like beam, she is fluid and moves with ease. Her first tumbling pass is an F rated double layout while the rest are of mediocre and low difficulty. Bottom of line: Rebecca is very impressive,extremely talented and has huge potential. She is what we call a non balletic artistic gymnast. In addition, she needs to upgrade her routines which she has shown her ability to. However, I won't be setting my expectation high, although she deserves it. Unfortunately in gymnastics, it doesn't only come down to the gymnast's talent but also to the country they come from and the situation around them. Talented gymnasts who are not from the big four often fall victims to the lack of funding, lack of having experienced coaches and judges' bias. But I will keep my fingers crossed and highly recommend to keep an eye on her. On a bright side, Alexander Alexadrov who coached Aliya Mustafina to a World AA title and an Olympic gold on uneven bars, had been appointed to contribute to the building of the Brazilian National gymnastics team since 2013. And not to mention, the upcoming Olympic games will be in Rio Di Janeiro, Brasil. Hopefully that will help Rebecca live up to her potential. Seda Tutkhalyan is a Russian gymnast from Armenian descent who was born on the 15th of July, 1999 in Moscow, Russia. She comes from an athletic family. Her father, Gurgen Tutkhalyan who competed for Soviet Union, was a four-time world champion in Sambo, while her older brother, Vae, currently competes for Belarus in sambo wrestling. She competed at last year's European Junior championships where she won gold with her team but did not win any medal individually. She placed fourth on vault, seventh in the all around and on balance beam, and eighth on floor exercise. However, Seda did not capture the world wide attention up until the second Youth Olympic games in Nanjing. There, she repeated her compatriot Viktoria Komova's feat of winning the competition's all around gold. She as well won gold on uneven bars and silver on floor exercise, while on vault, she placed fifth. Seda's all around gold, was won with a fall on her last tumbling pass on floor exercise. On vault, she does a double twisting Yurchenko (5.8) and a round off half on forward layout (5.2). She had a nice height on her Yurchenko vault but bents her knees and separate her legs on the entry. She also seems to always take an extra hops on her vaults landing, aka uncontrolled landing. On bars, she has leg separation here and there. She lacks height on her release and doesn't point her toes on her transition from high bar to low bar. Her dismount, unlike a lot of gymnasts, does not cowboys her double front tuck but lands it a bit late. On balance beam, she has nice style and obviously potential but has some minor form issues like the leg separation on her sheep jump. She also struggles with consistency on her big skills. And she can do a G rated full twisting straight layout. On floor exercise, she expresses herself very well and incorporates her dance moves. Her tumbling is clean but not difficult at all. 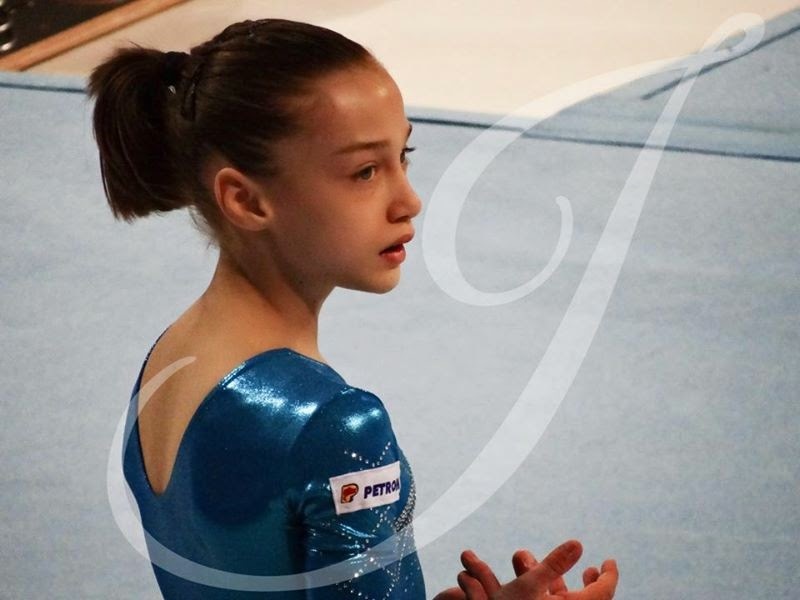 Bottom of line: If we were to compare Seda to Viktoria Komova when she was her age, Komova demonstrated the potential of being the next big thing while Seda does not fall into this category. She has visible errors, execution wise, and doesn't have the kind of difficulty, the sport nowadays requires. Seda has a strong presence and a lovely personality. Her style is far from a typical Russian, it is more like American gymnasts' style in 2002-2004 era with a mixture of Romanian gymnasts' general style. Having a different or an unusual style than the rest of her teammates/compatriots, makes her unique and is in my opinion always a plus. But beyond this, I can't guarantee that she is capable of being a big star in her senior years. Her execution and difficulty are not giving me any reason to be optimistic about her future, especially comparing her to the American gymnasts who are her age. She needs major improvements. However, I will keep my fingers crossed for her, because her style and personality wowed me and would like to see her improve because if she did, she will capture many hearts.